To sum up today’s drive, wet! It rained sometimes very heavy from half way between Broken Hill and Wilkannia. Add to this 5 Kangaroos, 2 Wombats, 4 Emu’s, and 2 dingos made for a challenging drive. Starting early helped. 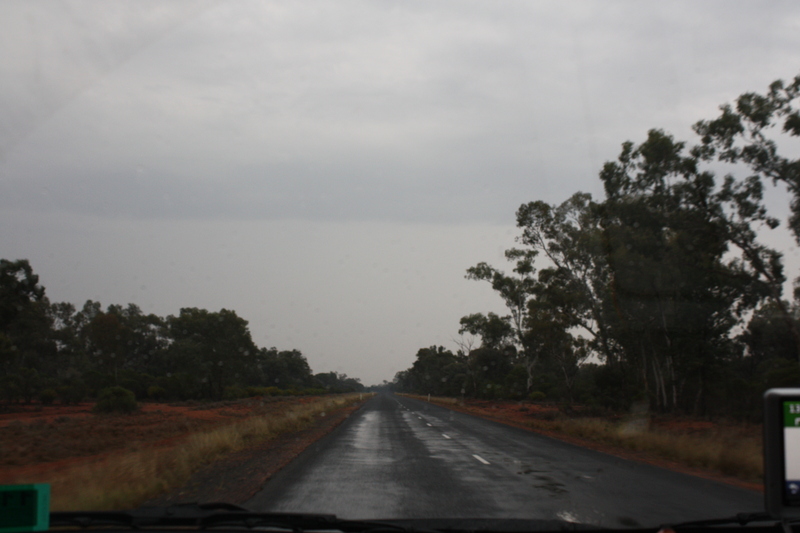 We checked the Wilcannia to Bourke road which is a red dirt road with a sign about 100m down the road saying ‘differing conditions, if wet, road is closed’. Well it was definatally wet so a quick u-turn and back to bitumen. Had we had a big 4WD with a winch, would have given it a go. So head to Cobar where we had lunch. Then the last leg of the day, north to Bourke. Serious distances in these sections with Wilcannia to Cobar a cool 260 odd km’s and then Cobar to Bourke 165km with nothing at all between them. Anyway, it’s time to get some sleep ready for the morning. Check back tomorrow to see how we go. By the way, figured out the problem on Day 1 with the GPS tracking system and it’s now all working again (while we’re driving). See it here. Tagged bourke, broken hill, cobar, dingos, emu's, heavy, kangaroos, rained, red dirt, wilkannia, wombats. Bookmark the permalink.